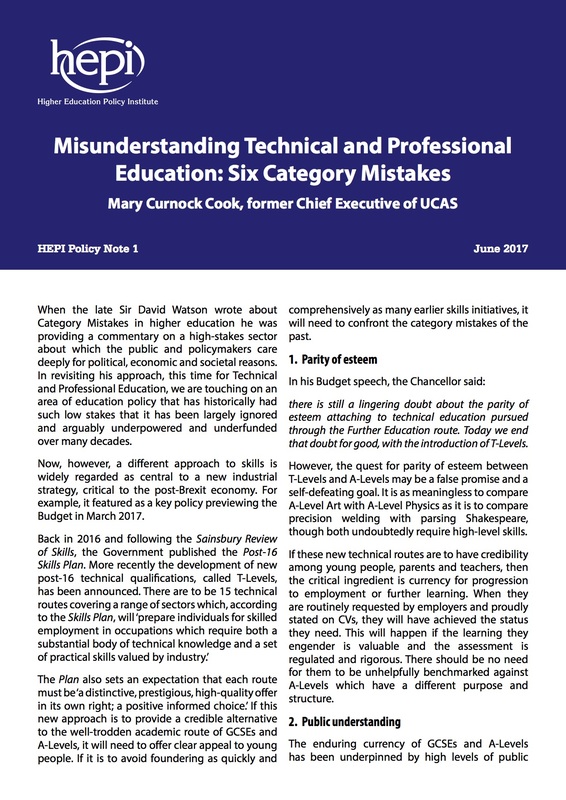 Parity of esteem: The new T-Levels are supposed to give technical education the same status as academic education. But they have a different purpose and structure to A-Levels. So they will succeed only if they provide progression to employment or further learning and are demanded by employers. Public understanding: GCSEs and A-Levels enjoy high public understanding. In contrast, it is unclear if T-Levels are umbrella qualifications for a range of occupations or aimed at specific occupations. The ‘Creative and Design’ route, for example, includes ‘art producer, graphic designer, audio-visual technician, journalist, product/clothing designer, upholsterer, tailor, furniture maker’. It is unlikely one qualification could cover all this. Naming: A-Levels are ‘Advanced’. But the ‘T-Level’ conflates a purpose (‘technical’) with the scale of the challenge (Level). If T-Levels are to be Level 3 qualifications (like A-Levels), then what term is to be used for Level 2 technical and professional qualifications? An intuitive naming convention for the new routes is essential to public understanding. Tripartitism… : Splitting qualifications into distinct technical and academic pathways leaves ‘Applied General’ qualifications, like BTECs, roaming free. Re-categorising them as ‘academic’ qualifications, as has been suggested, would ensure confusion among learners and employers. …or Bipartism? It is said the new routes will be delivered in FE colleges, full-time or as part of an apprenticeship. But, if they are to have the desired currency and reputation, many school sixth-forms could cease to be viable. However, if schools continue to deliver Applied General qualifications such as BTECs, colleges may struggle. Careers education: T-Levels are to be promoted as a post-GCSE option. Yet young students will have had no prior exposure to the 15 pathways. It will be difficult for a STEM-orientated GCSE student, for example, to choose confidently between the ‘Engineering and Manufacturing’ pathway and the ‘Transport and Logistics’ pathway without top-notch careers education. Google EUREKYS to read my article 138 – THE WELLBEING OF STUDENTS IN THE UK.